Whenever we discuss with coaches the most effective ways to implement their season plans, we always start our discussions with the need for proper execution of Parametric sets. This approach is always productive, since Parametric Training theory discloses the optimum changes of individual adaptation during the season. The Parametric theory also suggests the most effective applications for achieving maximum progress in critical elements of performance. Actually, no other contemporary training concept explains the principles of human adaptation to physical exercise better than Parametric Training concept. When designing a “perfect” training program and individual daily sets, coaches usually manipulate a significant number of variables in hopes to find a “golden combination” that will bring the desired improvements to their athletes. In science and especially in engineering, in situations when we deal with multiple variables with unknown interrelations, it is common to apply the Parametric approach under which we study the effects of the application of a single variable (parameter) while keeping others constant. In sport, we can limit almost limitless number of available variables to distance, intensity (by effort, pace or speed, etc. ), number of repetitions and rest between them. We also want to connect physiological parameters such as heart rate, lactate accumulation, VO­­2max , etc., and study how different combinations (strategies) of training variables may influence each other as well as the final outcome of the training program. This research led to the discovery of Parametric Training principles which became a cornerstone for understanding the nature of adaptive reactions under different training strategies. And so, we define Parametric Training as a training program in which the athlete keeps one training parameter constant while improving other training variables (speed, duration of effort or number of repetitions, etc.) over a period of time. In the current version of our training platform, the default parametric sets are included into weekly schedules and workouts automatically by default. We apply the most effective training distances for achieving the maximum training effect and then calculate the beginning intensity, the number of repetitions and physiological reactions, based on profile settings and season progression rates selected by the coach. While this approach is successful, there are of course situations where you may want to change the default sets parameters to achieve specific individual goals or simply apply parametric training principles in a different way, such as on a specific stroke and distance or perhaps for kick or pull sets. This enhanced manipulation of training parameters allows the user to optimize the desired effect and maximize the individual adaptive processes in a very specific and controlled way. Several benefits can be achieved from the application of parametric sets. For one, and this is absolutely critical for the understanding of the parametric concept, under the first parametric strategy there is no limit to the amount of capacity we can build at any given intensity level… Yes, you’ve read this correctly! As long as you are using parametric principles correctly, the only factor that limits capacity growing at a given (fixed in time) intensity level is sleep deprivation. In other words, the application of parametric training principles allows building practically unlimited work capacity. The inclusion of the parametric sets into the overall training plan significantly reduces the risks associated with overtraining which is yet another substantial benefit of this approach. This happens due to the organic nature of load progression dictated by actual athlete’s abilities and not by the coach’s “wishful thinking”. In other words, the progress is not forced on the athlete but rather achieved through a natural optimum adaptation ability. As confirmation to this phenomena, the athletes under proper parametric training protocols experience better sleep patterns and stronger immune reactions. We can explain these effects with optimum development of adaptation mechanisms. In 3S we rely on the first parametric strategy to build extra capacity. However, in swimming we do not compete in capacity alone. In most cases, we compete in time on the distance of competition and therefore the main determinator of success is usually expressed in the power (i.e. speed) we can maintain for the duration of the event. And so, the logical question which usually pops up – What is the relation between the speed and capacity components in the training process? can finally be answered. The answer to this question can be found through a deeper understanding of the effects of parametric training strategies, their interrelation with each other, and position in the training season. By the way, this way thinking forces us to revise our views on conventional periodization and start planning for necessary adaptations first instead of being fixated on training loads (please access our course on Season Planning techniques to learn more about planning principles). Parametric training concept was always a cornerstone of 3S success. Until now we did not allow our users direct access to this very powerful technology. However, with more coaches relying on this training principles, we decided to open the possibilities parametric training presents to a whole new level through a new, revolutionary Parametric Set Planner which is opening the ability to manage practically all key variables of Parametric sets and apply then individually. The default Parametric exercises in the 3S program are depicted with an asterisk added to the rest time between repetitions (on our example it is the row in green color). In the default mode the set does not require any special input from the coach. The critical parameters to follow are the target time, number of repetitions and the rest time between them, which is similar to any other daily sets. However, what if the coach wants to change the stroke, working distance or even the week the parametric application starts and ends? Set settings which include stroke, working distance, number of reps, week to introduce and end in the season. These functions are also connected to the Parametric Strategy aggressiveness factor, which defines the target “accumulation rate” (the factor which determines the increase of repetitions over time). 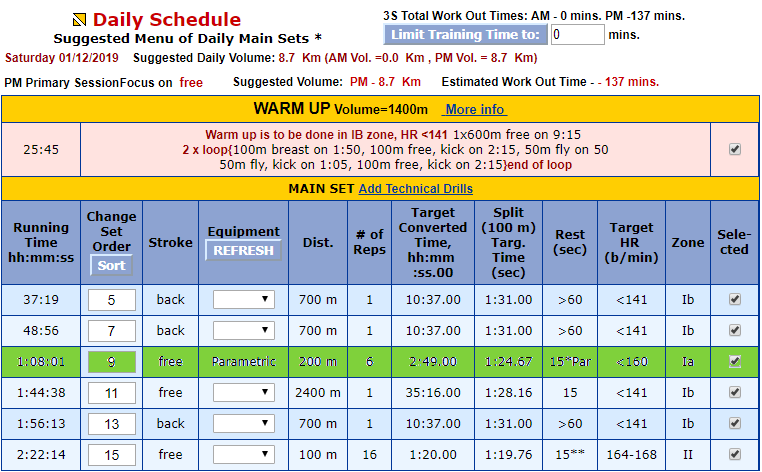 Set intensity settings allow the user to manipulate the pace in a given set at the time the set is introduced. To our satisfaction, this tool allows full control over the parametric set planning, leaving no room for guessing or compromises. The main goal of the parametric application (first strategy) is to grow the number of repetitions at a fixed pace from week to week. However, several other strategies are possible. In reality improvements in work capacity which are dictated by individual adaptation thresholds, also influence stroke power and efficiency, as well as corresponding physiological adaptations. For example, the process of building overall set distance (by adding more repetitions from week to week), is typically accompanied with improved stroke efficiency. This is expressed through increased power of stroke (distance per stroke) and physiological efficiency, which is expressed through diminishing working and average heart rates at the same level of intensity. These effects can be achieved using default suggestions, without special emphasis on these parameters. However, as a coach, you can also put special emphasis on each specific element and include conscious and objective control over both stroke rate and heart rate in each set. You will then be thrilled with the results you can achieve. Manipulation of training parameters in parametric sets and their strategies requires an in depth understanding of Parametric training principles. Further explanation of Parametric training principles and their benefits can be found at 3S University web site. And if still in doubt, please shout out!